Suitable for the less able, it has 2 double bedrooms, a twin and a children's room with single bed, cot, toys and games. 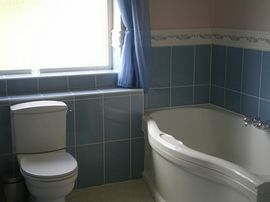 Spacious bathroom plus shower/WC off utility. 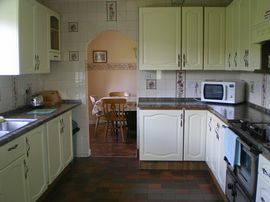 Large well-equipped kitchen/diner, lounge with open fire, TV, video & DVD, and a dining room. Fridge/freezer, washing machine, dishwasher, tumble dryer, oil central heating add £25/wk. Lawned area, picnic benches, babysitting. 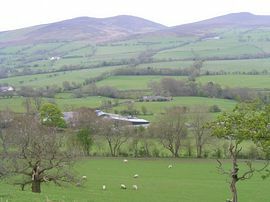 Local walking, fishing, pony trekking, steam railway and excellent for exploring the Vale of Llangollen, Clwydian Hills, Llyn Brenig, Clocaenog Forest; easy driving distance to Snowdonia, North Wales coast and Chester. 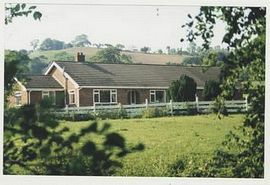 The bungalow was built in 1980, at the time to provide a home for ourselves. 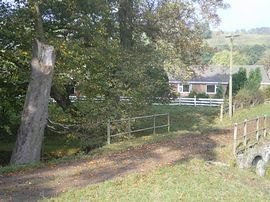 The bungalow is approached over a lane with a cattle grid and a side gate for pedestrian access. It has ample parking space for 6 vehicles and wheelchair access is via a removable wooden ramp. There is outside light and 2 steps into the hallway. The front garden has a level area with access from the front door and over the tarmac parking area. The ground floor of the property is all on one level with plenty of room to manoeuvre a wheelchair with all doors having a clear opening of at least 800mm but all doors open inward to all rooms. Electric light sockets are 1400mm from floor level. There are no additional handrails in the bathroom or shower room. The TV has teletext by remote control. There is no payphone but most mobile phones receive a reception. LLANGOLLEN (pop. 3,000) Market Day - Tuesday. International Eisteddfod (July), Steam Railway, Canal & Museum, Castell Dinas Bran, Plas Newydd, Motor Museum, Honeypots Pottery, Valle Crucis Abbey, Chirk Castle, Horseshoe Pass. RHYL (pop. 25,000) Sun Centre, Botanical Gardens, Ocean Beach, Sports Centre, Skytower, Bodelwyddan Castle, SeaQuarium Centre, Open Air Events Arena, Terror Tombs, Children's Village ,Drift Park, Nova Centre (Prestatyn). DENBIGH, RUTHIN & MOLD Denbigh Castle, Ruthin's medieval and Tudor architecture, Ruthin Gaol, Medieval Banquets, Nant Clwyd House (Ruthin), Theatr Clwyd & Art Gallery (Mold), Daniel Owen Centre, Llyn Brenig Visitor Centre, Loggerheads Country Park (Mold), Erddig Hall (Wrexham), Dibleys Nurseries (Chelsea gold-winner), National Whitewater Centre (Bala). *2009 Lowest price depends on party size - £263.00/2-3, £299.00/4-7 in Winter.